YILPORT Holding, the Turkish Yildirim Group’s port arm, reports a 9% increase in container throughput of all its terminals in 2017, informs the latest edition of Yilport’s corporate publication “Connection Magazine”. The overall volume of Yilport facilities grew to 4.3 mln TEU in 2017, which is 9.4% more than 3.93 mln TEU in 2016. The growth was led by its 10 container handling terminals in Turkey, Scandinavia, Iberia and Latin America. The company sees Turkey’s growing seaborne trade and Swedish exports as the main drivers of growing volumes. Thus, the highest growth rates were recorded at the Group’s Turkish terminals: Yilport Gebze, the Group’s home terminal, handled 501,284 TEU in 2017 (+26% over 2016), Yilport Gemlik closed the year with 474,019 TEU (+30% over 2016), supported by an ongoing port expansion. This impressive rise was accounted for by the strong export performance of the Turkish economy. Yilport’s Nordic container terminals in Sweden and Norway grew together 13% compared to 2016. Gavle Container Terminal in Sweden recorded 251,978 TEU and Sjursoya Container Terminal in Norway recorded 207,528 TEU. Here, the volume increase was driven by the strong Swedish core export market growth, as well as by absorbed volumes from competitive terminals during labor disputes. In Latin America, Yilport terminals – Puerto Bolivar in Ecuador and Port of Paita in Peru – displayed a 22.6% growth compared to 2016. The Group’s Iberian terminals – 2 in Spain and 7 in Portugal – all together handled 1,176,496 TEU in 2017, up 5.8% over last year. The main impetus here came from the Port of Lisbon, where Liscont recorded 233,497 TEU (+25%) and Sotagus – 160,886 TEU (+37%!). 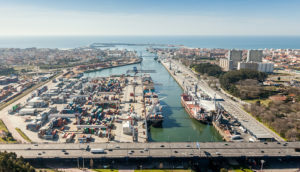 Yilport Leixoes, the largest Yilport terminal within the Iberian portfolio, closed 2017 with 625,542 TEU, slightly below 649 th. TEU of 2016. Malta Freeport, where Yilport has a 50% stake, handled 1.75 mln TEU, up 2% to 2016. With a consolidated annual handling capacity of over 10 mln TEU, Yilport Holding was ranked #13 among world’s top terminal operators in Drewry’s Global Container Terminal Operators Annual Review and Forecast 2017 report. Apart from container services, the Group’s facilities also handle liquid, general, Ro-Ro, and bulk cargoes.